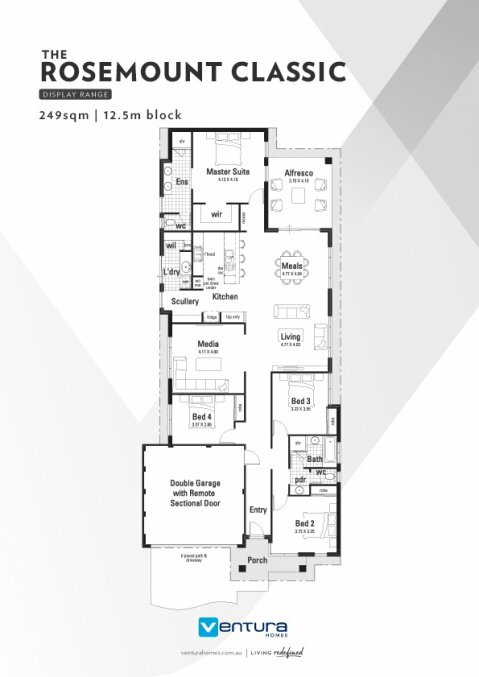 With its striking elevation boasting feature tiled blade wall, pier and Portico, The Rosemount is a stunning four bedroom, two bathroom home designed for modern family living. The stylish Portico invites you down the entry passage with recessed ceilings, past the three minor bedrooms and step-down media room into the large living and meals area that opens through stacking doors onto the spacious alfresco. The gourmet kitchen features a huge island bench with waterfall end, underslung sink and convenient breakfast bar.